Photo: A joyful self portrait. 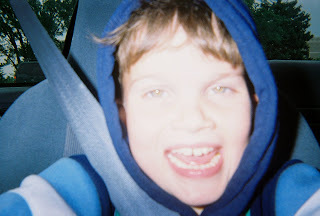 Here my son had grabbed the camera from my hands and is rebelling with glee by taking a picture without permission. Once the camera was in hand, I admittedly let him take the picture as to avoid a meltdown. Yes we were in a car, but it was parked. I was trying to quickly snap my own portrait before taking the film into be developed but failed so miserably that I won't be publishing it. My brow was furrowed and I looked strained. His happy attempt was much more successful. Frida Kahlo looks strained in this picture but unlike my own attempt, it is a successful kind of strained. This is a portrait that will be long remembered, unlike my son's picture or my own (which I need to delete). Kahlo's work deserves the recognition. She probably took hours to create her portraits, while my son took all of five seconds to capture his. Anyway, this well known artist dealt with pain for most of her life which may account for the strained expression. Like my son, Kahlo was also a rebel of sorts. Although born in 1907, she claimed her birth date was during the same year as the start of the Mexican revolution. She also refused to buckle to the expectations of seeing ladies without excess facial hair or a unibrow. The depiction of facial hair in her portraits was her trademark. I could rebel in that fashion, but would rather not!! Call it vanity, self preservation or just plain timidity. My point: Rebellion has it's advantages sometimes. Kahlo's rebellion led to a successful painting career. It gives me hope. It's possible he could be a photographer, director or have some other successful career. My son rebels against us and his teacher at times. But fortunately sometimes rebellion means putting a new way of thinking out into the world. It can also mean staying strong and confidant. I always think the rebellious have a gift. My friends growing up who were the most rebellious are also now the most creative and the most successful. I like Kahlo's work. Did you see the movie about her? It was quite good. You make a great point. I so agree. Why not re-examine the cultural and social imperative of obedience, itself? Doing what someone else tells one is only useful if it is a good thing to do. Autistic people are commonly dismissed as "noncompliant", but is this really accurate? No. They take in information, including from others, and then decide for themselves. Even when these are good decisions, better than those they may have been pressured to choose, they are demonized just because they did not do what they were told. And is that really even a good thing? Yes, it may be difficult at times to avoid being controlling (as parents are told to be) and it may try one's patience to explain the why of something for the nth time. But nurturing this tendency to reason and decide for oneself, intrinsic to autistic nature, will result in a principled, independent-minded adult - think of all the evils that have been visited upon human society by blind obedience! I wrote the post almost five years ago, so had to go back and reread it. We're a household that prizes critical thinking. You make a valid point. My son is now 14 and his control issues get him into trouble sometimes. So we tell him "yes, you choose how to behave, but you also have to realize what the consequences will be." We want him to be independent, but also compliant enough to keep out of trouble. It's a delicate balance.